IMPORTANT : Due to popular demand, most of our junior training sessions are currently full. If you would like to go on the waiting list please email details (name, age, email) to juniors@chorley-athletic-and-triathlon.org. An exception to this is our swim session 6-7pm at Brinscall pool still has some spaces. 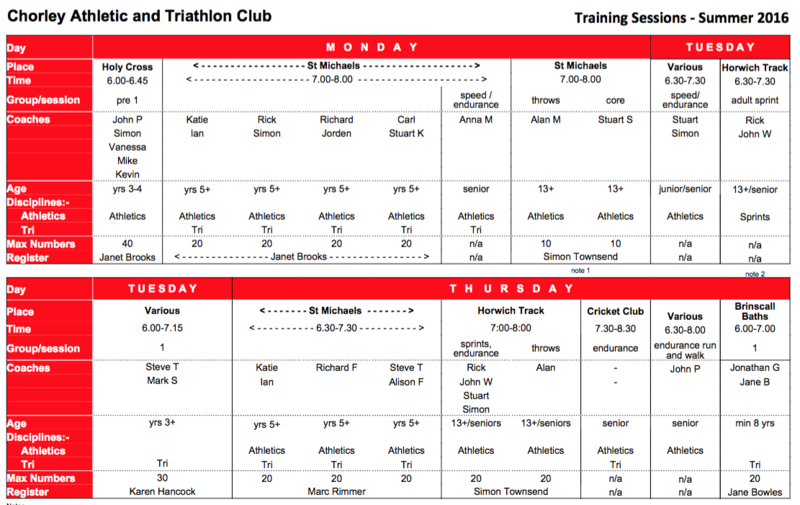 Below is a list of training sessions where all our members and people thinking of joining Chorley Athletic and Triathlon Club are welcome to attend. Any fees charged go to help offset real costs incurred with running the sessions. Thanks to all coaches and assistants who give up their time to help others. Mon - 18:00 - 18:45 - John P (Fundamentals) training session. Mon - 19:00 - 20:00 - Juniors - Holy Cross High School. Thu - 18:30 - 19:30 - Juniors - Parklands High School. Mon - 18:30 to 20:00 - Juniors - Holy Cross outside grass track/trail & sportshall. Thu - 18:30 to 20:00 - Juniors - Astley Park. Thu - 18:30 to 19:30 - Juniors Horwich Track. Winter programme will revert back to 1 hour sessions when back indoor from October to March. Please note new training times - this is to incorporate quality training sessions as well as coaching expectations/plans and feedback goals/achievement. We felt that we do not have enough time to address some of these points to reach the full potential of the session alongside addressing the athletes understanding and questions. We also need to ensure that they are putting in quality warm ups and cool downs. Finally on top of this we need to address both the athlete and parent together and it is important that they are present at the end when the final messages are being delivered, alongside their child. Mondays will be closed for two weeks 20 July & 27 July - this may be 4 weeks - Reopen 17 August. Thursdays will be closed for two weeks only 23 July & 30 July. Each training session is to incorporate 2 separate disciplines per session. Incorporate core sessions in mesocycle 6-8 week training plan. e.g. Sit ups - how many quality ones can you complete in 30 seconds. Press ups - how many quality ones can be completed in 1 minute. Timed Plank - quality plank for 1 minute and build up from there. Timed Squat thrust - how many quality completed in 30 seconds.